Oxford Clarendon Press. Very Good with no dust jacket. 1945. Hardcover. 0198145217 . Very Light edgewear to spine ends. Bottom corners slightly rounded. Pages a little tanned. ; Greek Text with Latin apparatus and introduction. Orationes XLI-LXI. Prooemia. Epistulae. ; Oxford Classical Texts Oct (Scriptorum Classicorum Bibliotheca Oxoniensis); Vol. 3; 541 pages . Oxford Clarendon Press. Very Good with no dust jacket. 1951. Hardcover. 0198145217 . Very Light edgewear to spine ends. Light bump to top of spine and 2 corners. Light browning to endpapers. ; Greek Text with Latin apparatus and introduction. Orationes XLI-LXI. Prooemia. Epistulae. ; Oxford Classical Texts Oct (Scriptorum Classicorum Bibliotheca Oxoniensis); Vol. 3; 541 pages . Oxford Clarendon Press. Very Good+ in Very Good dust jacket. 1967. Hardcover. 0198145217 . Scholar's bookplate to inner cover (Robert Brown). Else book is fine. DJ is price-clipped. Light browning to DJ spine. Minor creasing to DJ. ; Greek Text with Latin apparatus and introduction. Orationes XLI-LXI. Prooemia. Epistulae. ; Oxford Classical Texts Oct (Scriptorum Classicorum Bibliotheca Oxoniensis); Vol. 3; 541 pages . Oxford Clarendon Press. Very Good with no dust jacket. 1939. Hardcover. 0198145209 . Upper corners lightly bumped. Former owner's name to ffep covered with white label. ; Greek Text with Latin apparatus and introduction. Orationes XXVII-XL ; Oxford Classical Texts Oct (Scriptorum Classicorum Bibliotheca Oxoniensis); Vol. 2.2; 214 pages . Oxford Clarendon Press. Very Good with no dust jacket. 1939. Hardcover. 0198145209 . Bottom corners slightly rounded. Pages a little tanned. Light browning to endpapers. ; Greek Text with Latin apparatus and introduction. 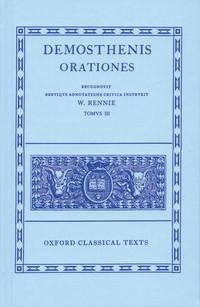 Orationes XXVII-XL ; Oxford Classical Texts Oct (Scriptorum Classicorum Bibliotheca Oxoniensis); Vol. 2.2; 214 pages . Oxford Clarendon Press. Very Good with no dust jacket. 1939. Hardcover. 0198145209 . Scholar's bookplate to inner cover (Robert Brown). Minor shelfwear. ; Greek Text with Latin apparatus and introduction. Orationes XXVII-XL ; Oxford Classical Texts Oct (Scriptorum Classicorum Bibliotheca Oxoniensis); Vol. 2.2; 214 pages . Oxford Clarendon Press. Near Fine in Very Good dust jacket. 1966. Hardcover. 0198145209 . Very light shelfwear to book else fine. DJ is price-clipped. DJ spine browned. 1 small closed tear (1 cm) and 1 tiny chip to head of DJ spine. ; Greek Text with Latin apparatus and introduction. Orationes XXVII-XL ; Oxford Classical Texts Oct (Scriptorum Classicorum Bibliotheca Oxoniensis); Vol. 2.2; 214 pages . Oxford Clarendon Press. Near Fine in Very Good- dust jacket. 1961. Hardcover. 0198145209 . Very light shelfwear to book else fine. DJ is price-clipped. DJ spine browned. Light Chipping to spine ends. ; Greek Text with Latin apparatus and introduction. Orationes XXVII-XL ; Oxford Classical Texts Oct (Scriptorum Classicorum Bibliotheca Oxoniensis); Vol. 2.2; 214 pages . Oxford: Oxford, Clarendon Press, 1958 Volume III of 4 volume set (The 4 parts will NOT be sold seperately) Standard Greek text of Demosthenes works from the "Oxford" series of classical texts. Preface in Latin, First published in 1903. Clean neat unmarked text.Minor signs of library ownership.. Reprint. Hardcover. Very Good/No Jacket. Ex-Library. Oxford: Oxford, Clarendon Press, 1958 Volume II part 2of 4 volume set (The 4 parts will NOT be sold seperately) Standard Greek text of Demosthenes works from the "Oxford" series of classical texts. Preface in Latin, First published in 1903. Clean neat unmarked text.Minor signs of library ownership.. Reprint. Hardcover. Very Good/No Jacket. Ex-Library.